In this edition of Vietnam Briefing, we discuss Vietnam’s current statutory requirements regarding payment, social insurance withholdings, and individual income taxation. We go on to explain the areas where compliance is likely to become a concern for HR managers. 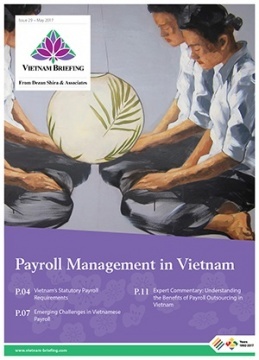 Finally, we describe the importance of payroll processing, touching on its adoption in Vietnam, the benefits of outsourcing, and the options available to those seeking to utilize payroll processing services. As companies establish new operations in Vietnam, one of the first tasks for businesses is to put employees on the new entity’s payroll. This will allow new market entrants to engage local workers and bring in managerial staff from overseas. But payroll administration can quickly become a significant undertaking, even for those who are well versed in market expansion. Payroll compliance and the ever-changing regulatory environment are a challenge for any expanding business. From individual income tax calculation to ensuring proper social security contributions, companies are required to conduct a variety of monthly compliance tasks to ensure that they are up to take with their statutory obligations. These areas of compliance can often be quite complex and take significant time to master, navigate, and implement effectively. On top of regulatory complexity, Vietnam’s rapid growth and desire to attract investment has led to a steady overhaul of the country’s regulatory infrastructure. While this bodes well for the long-term prospects of investment within the country, staying up to date with relevant changes can become a continual struggle, particularly for small and medium sized enterprises.